Lately, I have been enjoying the podcast, It's Been a Minute. The Tuesday episodes usually focus on one topic or guest. Last week's episode featured the producers of a a new documentary on Supreme Court Justice Ruth Bader Ginsburg, RBG, and one of my favorite NPR commentators, Nina Totenburg. The documentary sounds pretty amazing, but what was really cool about the podcast was a cool connection the the Air Force. One of the first supreme court cases Ruth Bader Ginsburg was part of involved a female Air Force officer. Naturally, I needed to know more. When I got a chance I googled up the case, and actually found two cases that she argued for Air Force women. The one mentioned in the podcast was the unequal application of dependent classification for women and men. Wives were automatically considered dependents, a necessary classification to secure medical coverage and other pay and allowances for family members. Female officers had to prove that their husbands were actually financially dependent on them (by at least 50%) in order for them to be considered a dependent. This was in 1973, and I had no idea this was the standard at that time. The second case where RBG and the Air Force crossed paths was of a woman facing discharge because she became pregnant while on active duty. This 1970s era rule I was aware of - the options then were keep the baby and be discharged or terminate the pregnancy and stay on active duty. The captain in this case wanted to give her child up for adoption and remain on active duty. Ultimately, the court agreed with her. I love this line from the court's decision: "Is there any evidence that pregnancy has some effect on ability to function that is different from any other temporary physical condition? For example, is there any reason to believe that a female officer who has suffered a fractured leg is better able to perform her job than a female officer who is eight days pregnant? The former gets medical leave and retains her commission; the latter is discharged. Why? If this be rational, nothing is irrational!" 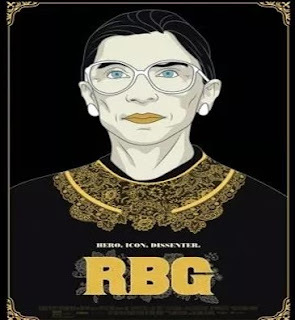 Ruth Bader Ginsburg is a much beloved figure here in DC, and I look forward to seeing the documentary and learning more. You can connect to the podcast below.